The bar mark type represents an axis-aligned rectangle that can be filled (via fillStyle) and stroked (via strokeStyle). Bars are used for many popular visualization types, including bar charts, grouped bar charts, stacked bar charts and histograms. top - the distance from the top edge of the parent panel. left - the distance from the left edge of the parent panel. bottom - the distance from the bottom edge of the parent panel. right - the distance from the right edge of the parent panel. 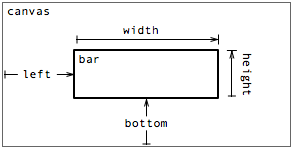 width - the width of the bar. height - the height of the bar. Note that these properties together over-specify the placement of the bar. In practice, only four (orthogonal) properties should be specified. This section looks at some examples. The left property is calculated using the automatic index variable. The index starts at 0 for the first datum, and is subsequently incremented by 1. Thus, with only four properties, a number of different visualizations can be expressed. More possibilities are available by using the additional top and right properties, as discussed next. You can even vary which properties are defined on a per-element basis, by using a function that returns null if the property is undefined. Sometimes it is desirable to specify the left and right properties concurrently, instead of specifying one in conjunction with width. This is valid—for example to make insets—but keep in mind that the left property is relative to the left edge of the parent panel, while the right property is relative to the right edge of the parent panel. This results in a bar width that is proportional to the panel width, which may not be desired. A similar situation occurs with bar height when top and bottom are used together. It may be better to pick one property for position (e.g., left) and another for length (e.g., width) and then perform subtraction in the length property if necessary, as is done in the Gantt chart example above. fillStyle - the fill color. strokeStyle - the stroke color. lineWidth - the stroke thickness. See the color documentation for more examples of acceptable values for stroke and fill styles.